It seems impossible that it's been three odd years or so since I last took in the glorious sweetness that is The Pains of Being Pure at Heart. And yet, that's exactly the situation. Thankfully, the band rectified things most agreeably, and their set at the Rock & Roll Hotel was nothing short of giddy pop perfection. Sporting a new lineup (lose some, gain some, as it were - and now the band can boast a set of twins! 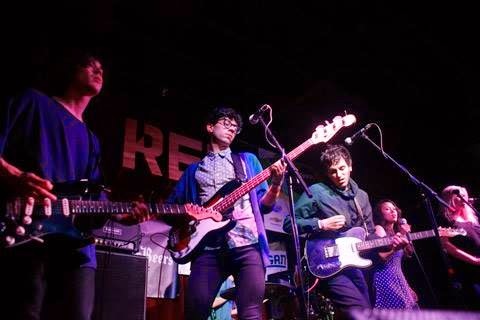 ), The Pains rolled into town in support of their excellent new record, Days of Abandon. I'm convinced that seeing this band live can turn just about any frown upside down, and though I've been in a pretty good mood lately the band made me feel nigh on gleeful. The set was heavily slanted to the new material, which was just fine by me. The first track from Days of Abandon, "Art Smock," kicked things off, and the gently wistful song actually got the DC crowd to hush a little with its prettiness. "Until The Sun Explodes" really set the tone for the poptastic evening, somehow recalling "Friday I'm in Love" while bursting with rambunctious sweetness. The new songs definitely feel a bit more purely pop than, say, the first Pains record, but there's a little bite to them that's just magical.